THE GRAND TOWERS MANILA is a two tower condo, 47 floors, walking distance to De La Salle University, College of St. Benilde, St. Scholastica's College and Arellano University. Convenient Location. A modern enclave which keeps you close to your daily destination. Aside from living beside top schools like DLSU, CSB, St Scholastica's College and Arellano University you are also a few steps to Vito Cruz LRT Station to get you anywhere in the Metro. And Minutes to Makati Central Business District and Ninoy Aquino Airport via Roxas Boulevard. First-Rate Amenities. A home of incomparable luxury with its 3000 sqm dedicated to recreation and relaxation facilities and one level of retail stores. Flexible Comfort. A space where you can find your own space. Choose from Studio, 1Bedroom and 2Bedroom Units. 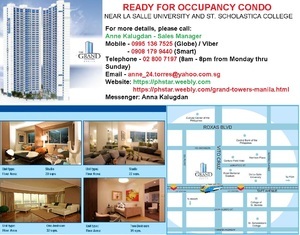 The Grand Towers Manila offers units and parking for sale and for rent.. The Grand Towers Manila is a condo project developed by Moldex Realty, Inc., The Grand Towers Manila has 47 floors and contains 1828 total units, Units range from studio to 2 bedroom. The Grand Towers Manila at Manila, Metro Manila has the following facilities: air conditioning, bbq area, cctv, fitness, garden, parking, playground, security, swimming pool and wi fi.